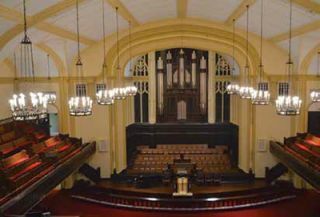 First United Methodist Church (FirstChurch), a landmark of downtown Dallas for over 165 years, features a rich music program, congregational activities, and two worship services each Sunday for roughly 1,000 congregants. Recently it sought to replace its existing sound system with a more current solution that could deliver greater intelligibility for both music and the spoken word. K-array KP102 line array elements were mounted at the proscenium line at the front of the sanctuary of First United Methodist Church in Dallas, TX. The new system, installed by Electro Acoustics of Fort Worth, TX, consists of 10 custom-color KP 102 line array elements, two KK 52 line array elements, two KM T18P passive subwoofers, four KA40 amplifiers, and 12 custom color K-array KT22 Tornado two-inch point source compact speakers.